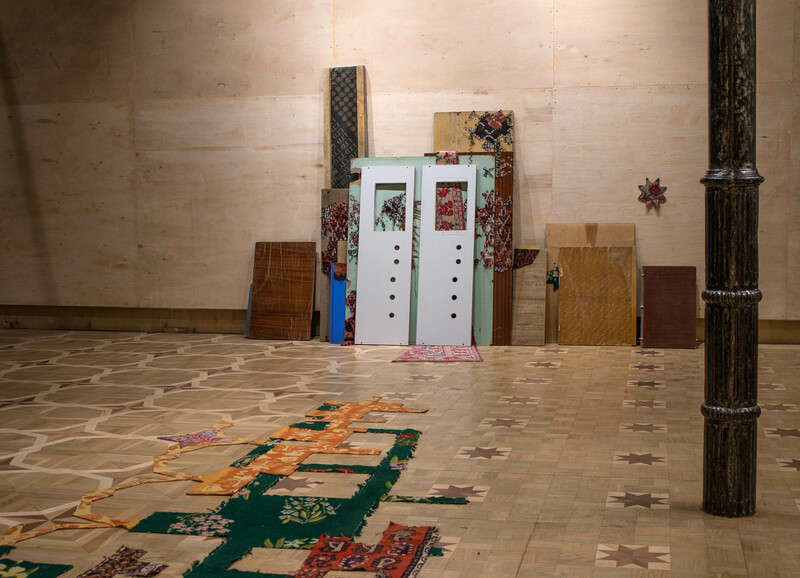 Untitled, from Material Migrations ongoing 2017; Installation view at the Tbilisi History Museum; Mixed scrap wood, metal staples and carpet: includes locally sourced and discarded industrially and hand made used carpets, and carpets brought from NewYork City Dimensions Variable. In Tbilisi, Herzog worked with local artists to research the region’s textile traditions, as well as the unique geometric patterning that is ubiquitous in its architecture. Her site-specific installation for Artisterium focuses on the Tbilisi History Museum itself, once an active caravanserai where textile merchants traded their goods. 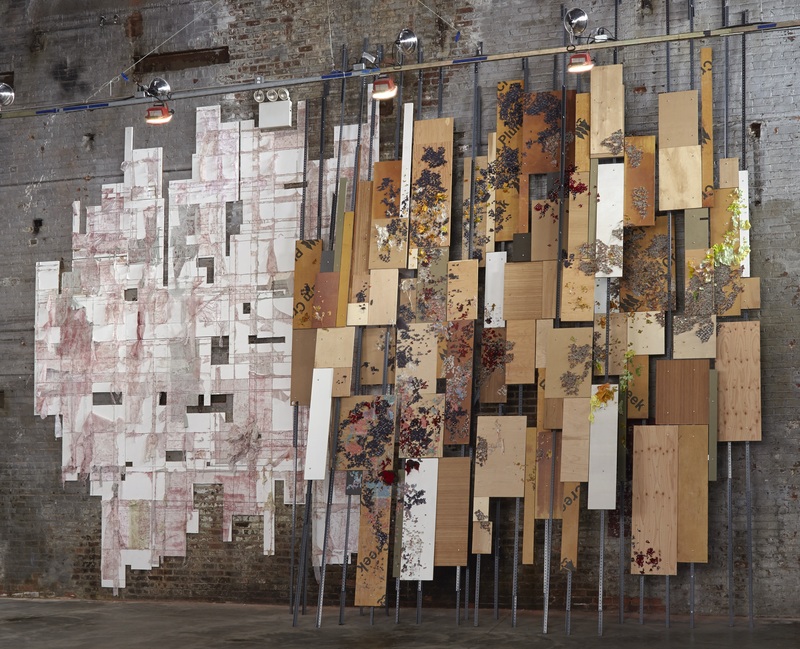 The work calls attention to two converging wooden floor patterns in the exhibition hall, revealing where previous structures have recently been torn down and others seamlessly erected. 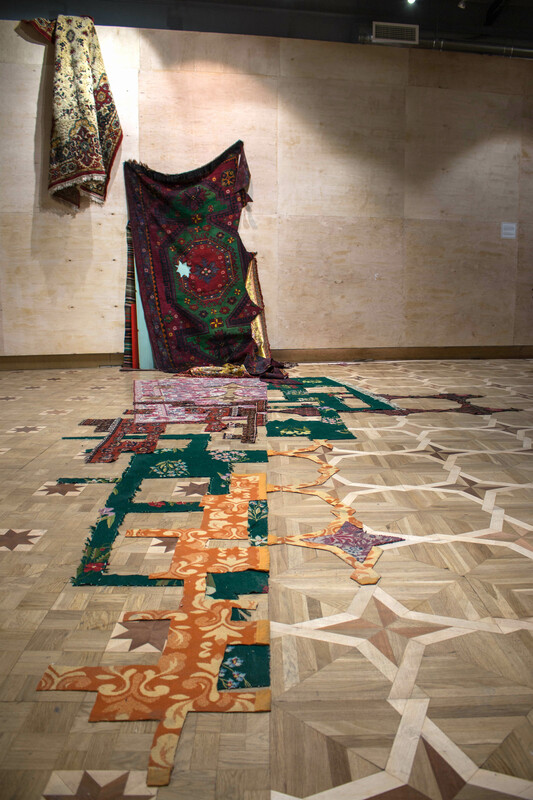 The raveling/unraveling in this case can be witnessed not only in her reconfigured rugs and fabric patterns, but also evidenced on the morphing ground that we stand on. Elaine Sexton: Distressed fabric, in the form of bedspreads and curtains, heavily stapled and recomposed on dry wall serve as source material for some of your recent work. You once pointed out, in conversation, that most fabric is either plant or animal-based, cotton vs. wool, for example, which alters the experience of material in context. Apart from the references to the domestic, choosing fabric intended for covering beds and windows, can you say what it is that draws you to working with textiles? Elana Herzog: For many years I have used material culture to consider aspects of ephemerality, entropy, pleasure and pain, attraction and revulsion. My current focus is on the global migrations of culture and technology as seen through the lens of textile. As I work I am building a language that is formal and abstract, as well as directly evocative of cultural and emotional experience. I have increasingly focused on the relationship between technology and culture, the hand and the mind, the body and the machine. I collect non-precious materials that I find, mainly second hand, discarded or cheaply mass produced. Their conversion into “fine art,” as a result of my intervention, raises questions of value, ownership and conservation. Where does value come from and how do we measure it? Can we, and how do we possess it? For me the term “material culture” encompasses the many “things” human society produces and lives with. It tells stories, marks time, charts navigation, migrations and conquests. Concepts like form and function, high and low art, business and pleasure, the profane and the profound, fall under this one umbrella. Its all stuff; capable of being cherished and reviled; traded, stolen, blessed, cursed, defiled and discarded. 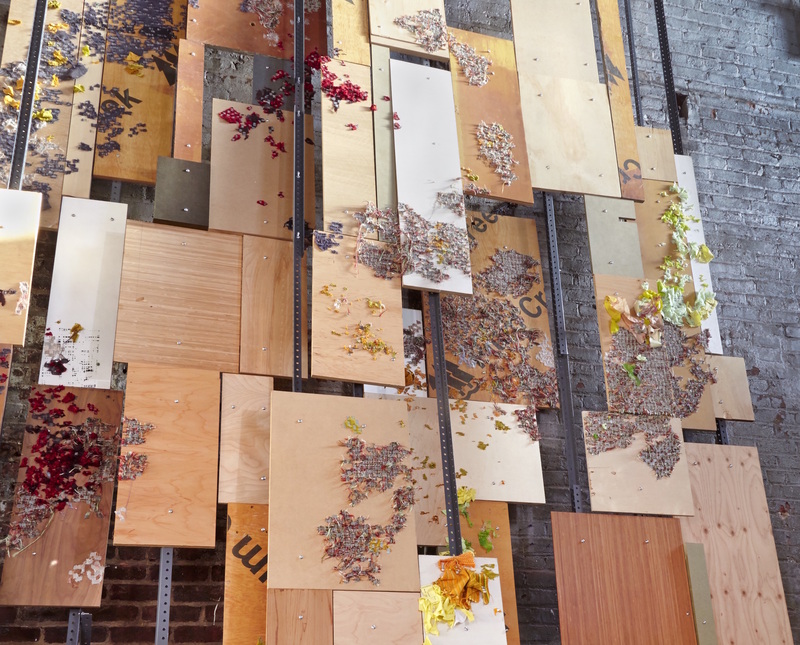 In much of my work during the past almost twenty years, I’ve used thousands of metal staples to embed (and then deconstruct) found textiles into various surfaces, including gallery walls, movable panels and mixed media constructions. My installations are characterized by a mix of rigorous hard work and playful, context-sensitive experimentation, in which the labor-intensive “making” and “unmaking” is ultimately subsumed into a final product that almost seems to dissolve. My interest in textile as a material for art making has changed over the years. I began by using it as an evocatively draped element in a mixed media sculpture. It also made reference to its own ubiquitous portrayal in classical sculpture and figurative painting, as surfaces that conceals but also delineates the contours of the human body. It went on to become a structure to interrogate; to tease apart through a deconstructive and reconstructive process. Over the years I have become more and more interested in the history of textile production, and its centrality to geopolitical events and human history overall. Elana Herzog lives and works in New York City. She is a recipient of a 2017 Guggenheim Foundation Fellowship. She recently returned from Tbilisi, in The Republic of Georgia where she participated in Artisterium 10, an annual exhibition of international artists. In 2017 she premiered Martha (The Searchers) a new ballet by Julia K. Gleich on which she has collaborated and contributed the visual components. Her work has been exhibited extensively in in this country and internationally in Norway, Sweden and Iceland, Canada, Chile and the Netherlands, and she has participated in numerous group shows at institutions such as the Tang Museum in Saratoga Springs, New York, the Weatherspoon Museum in Greensboro, North Carolina, The Kohler Museum in Sheboygan, Wisconsin, David Castillo Gallery in Miami, and at The Brooklyn Museum and The Museum of Arts and Design New York City. Herzog was an instructor at Yale University from 2012-2016. She will be in residence at The MacDowell Colony, in Peterborough, New Hampshire for six weeks in 2018.